Both of my steampunk third grade I Can Statement sets in one bundle! 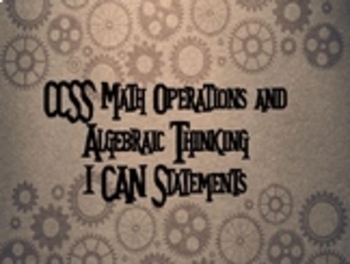 ELA I Can Statements: 84 slides with I Can statements aligned to the CCSS ELA third grade standards. They have a steampunk background, and a fun, steampunk looking font. These I Can statements are full page, and include the standard number in the bottom right corner for your (and your admin's) reference. Math I Can Statements:55 slides with I Can statements aligned to the CCSS Math third grade standards. They have a steampunk background, and a fun, steampunk looking font. These I Can statements are full page, and include the standard number in the bottom right corner for your (and your admin's) reference.